In metal-part manufacturing, chlorinated paraffins are used as extreme-pressure (EP) additives to provide boundary lubrication for extreme drawing, stamping and machining operations. Chlorinated paraffins are inexpensive, readily available (for now, anyway) and extremely effective at relatively low treatment rates. However, following decades of scientific study, it now is widely known that chlorinated paraffins are non-biodegradable and bio-accumulative, and highly toxic to aquatic organisms. Due to the potential for long-range environmental impact, they have been classified as persistent organic pollutants, and are subject to phase-out. Most believe that sometime in 2016 the EPA will ban the manufacture and consumption of most chlorinated paraffins (to include the short-, medium- and long-chain varieties). 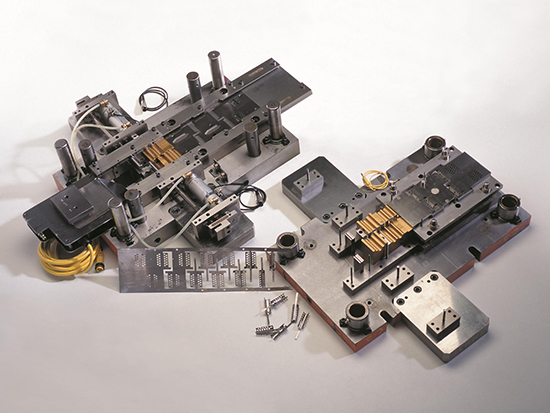 After a rigorous testing process, New Hampshire Stamping has successfully abandoned the use of chlorinated paraffins in producing precision progressive-die stampings. A century ago, various industrial and commercial applications first began employing large amounts of liquid chlorinated paraffins. The decade leading to World War II saw production of chlorinated paraffins for use as EP additives in metalworking fluids. During the war, their use as flame retardants in clothing and other mostly military applications rose steeply. Though heavily used by the U.S. military, the expanded use of chlorinated hydrocarbons began in Germany. The October 1946 issue of Harper’s magazine contains an article by C. Lester Walker entitled “Secrets by the Thousands,” detailing the exploits of the U.S. military in the months following the surrender of Nazi Germany. It is estimated that the U.S. government obtained more than 1 million individual items of Nazi secrets pertaining to scientific, industrial and military technologies. A needle in the haystack was chlorinated-paraffin grease used to lubricate a small generator, which increased the voltage from that of a conventional flashlight battery to upward of 15,000 V.
This generator operated an infrared device enabling soldiers of the Wehrmacht to see at night, with the device containing a tiny electric motor spinning a rotor at 10,000 rpm. The motor had degraded every lubricant used, due to the extraordinarily high operating speed and the excessive volume of ozone it produced. Due primarily to the inherent properties of chlorinated-paraffin technology, the generator ran seamlessly for 3000 hr.—at the time, an unbelievable technological feat. Following World War II, with a boost from this mind-boggling German application, the manufacture and consumption of chlorinated paraffins for a multitude of industries skyrocketed. But it would seem that the usage of chlorinated-paraffin technology is coming to a close, with the pursuit of alternatives a prudent approach for metalformers. That’s exactly what Steve Costain of New Hampshire Stamping (NHS), Goffstown, NH, did when, in June 2013, he contacted International Chemical Company (ICC). NHS, a manufacturer of precision stampings, uses stainless and carbon steel, brass, copper, aluminum, silver, gold and hundreds of thousands of pounds of Inconel per year. It primarily employs progressive-die stamping presses operating at speeds to 200 strokes/min. Lubricant sprays onto coil and at intermittent stages of the stamping process. NHS had a big problem: Chlorinated lubricant was causing the trichloroethylene in vapor-degreasing equipment to break down, requiring the addition of expensive stabilizers. Under extremely high temperatures, chlorinated paraffins break down and become highly acidic, coating the equipment and acidifying the bath. As a remedy, NHS’s chemical supplier recommended the use of nonchlorinated oil. NHS contacted J.B. Associated, Sagamore Beach, MA, the local ICC representative, which in turn put NHS in contact with Mike Pelham at ICC. ICC offered to perform comparative lubricant tests at no cost to NHS, both at the ICC lab and at an independent laboratory. Costain shipped to ICC samples of the stamper’s most difficult alloys along with a sample of the chlorinated lubricant. Following a battery of tests, an analysis was made available to NHS for review as summarized in the accompanying two tables (see Analysis of New Hampshire Stamping Samples). The two primary data points, Umax and Pmax, denote the depth of the draw and the applied pressure, respectively. 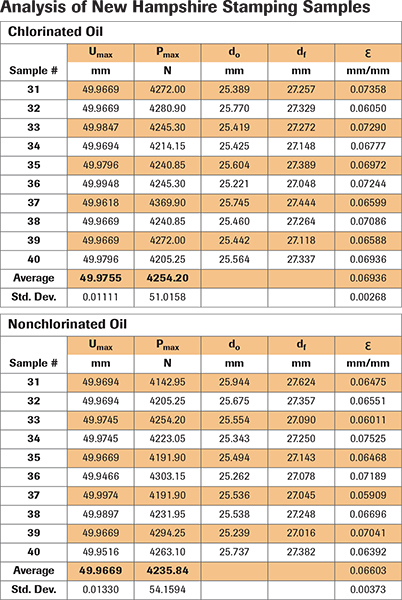 The data show that ICC 2801-DL and the chlorinated lubricant perform the same. In many cases, it is difficult to replace chlorinated products with those that are nonchlorinated, but this analysis demonstrates that ICC 2801-DL is a viable alternative. Costain studied the data and determined that NHS would like to begin utilizing the nonchlorinated alternative. He also requested that ICC perform occasional testing of used lubricant to ensure that the formulation does not break down during manufacturing, or degrade via the drum-top filtering process that NHS had recently installed in an effort to reduce lubricant consumption and disposal costs. Subsequent testing has revealed no degradation of ICC 2801-DL. 2) Galling while working primarily with stainless steel. ICC shipped two additives to NHS that could be blended onsite with the filtered oil and used immediately in the presses. The additives proved successful at eliminating the problems, but treatment rates needed to be finalized for production. Over the course of a year, NHS and ICC continuously tweaked and tested ICC 2801-DL to find the perfect balance of viscosity, boundary lubrication, stain inhibition and cleanability. In September 2014, the final, customized version was made available to NHS, now called ICC 2801-NH. It includes an additive specifically engineered for draw performance on stainless steel, and a metal passivator to prevent discoloration of sensitive alloys. But most importantly, this nonchlorinated straight oil contains a synthetic sulfurized component that provides equivalent, and in some cases, superior performance to that of chlorinated oil, without the many operational and environmental problems associated with the use of chlorinated lubricants. Article provided by International Chemical Co., Philadelphia, PA; 888/CALL-ICC; www.e-icc.com.